Old Rishworthians were denied victory over second-placed Scarborough with the last play of yesterday’s Yorkshire One game. The home side were gutted as the final whistle blew after a conversion gave the visitors a 34-32 win – and none more so than man of the match stand-off Josh Kelly, who scored all but five of his team’s points. He provided a master class in goal kicking, using the fierce wind brilliantly to land several massive penalties and one superb drop goal from almost halfway. Almost all his kicks came in the first half as the home side infringed. 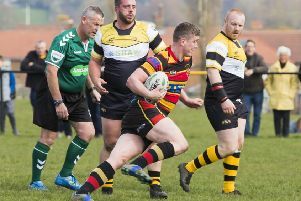 But it was a different story in the second half as Rishworthians found themselves penalised time and time again at the breakdown. They incurred two yellow cards as the desperately tried to hang on while the visitors threw everything at them. In the end it came down to another penalty in the last seconds under the posts and Scarborough powered over against the tiring home men with the conversion only a formality. While it was penalty after penalty against the Copley men in the second half, it was the other way during the first with Rishworthians getting one almost straight from the kick-off, which Kelly duly slotted over. A brilliant clearing kick from scrum half Ed Cockroft led to another minutes later and Kelly extended the lead. Scarborough looked dangerous with the ball in hand throughout the match and they sliced through the home defence for a converted try to take the lead. Taking advantage of the fierce wind, Kelly then kicked a massive penalty from halfway. A further attempt from halfway near the touchline just drifted wide but he kicked a brilliant drop goal from halfway and followed it with another superb long-distance effort to make it 15-7. A fine Rishworthian move almost brought points as Cockroft, prop Harry Whitfield, and the Flanagan brothers Chris and Luke all combined before the ball went to ground. The lead was extended short after as Cockroft intercepted and ran in under the posts, Kelly converting. Scarborough then exerted intense pressure and with the last act of the half scored a converted try to make it 22-14 at the break. While they led, Rishworthians never looked comfortable and a quickly taken penalty caught them napping and sloppy tackling allowed another Scarborough try. The home men came back strongly, though, and a sustained period of pressure brought a try with Kelly crossing from short range and then converting his try. When he added a penalty minutes later it looked like a great win was on the cards. The visitors had other ideas and put Rishworthians under constant pressure. The home men gave away a series of penalties which ended with lock Fraser Swarbrooke going to the bin. While he was off Rishworthians conceded a pushover try soon followed by a successful penalty kick, which in the end proved crucial as it left the score at 32-27. They defended desperately, also losing wing Anthony Shoesmith to a yellow card, and it looked as though they would hang on until the final penalty with only seconds remaining left them reeling. The Development team lost 22-17 at Yarnbury, with tries for Will McDonnell, Tom Cockroft and James Whiteley. Kurt Sutcliffe added one conversion.